How to use Chemical Analytical Techniques & Services in the Courtroom, Avomeen Testing Laboratory Announces the Release of CEO Shri Thanedar’s Recent Interview with AZOM. Chemical testing laboratory Avomeen Analytical Services announces the release of CEO Shri Thanedar’s Ph.D. interview with Azom. The interview focuses on general industry questions and the use of analytical techniques in the courtroom. results found by these advanced analytical laboratories can often times can make or break a case for a lawyer. A chemical testing laboratory may not be the first place one would think of when they are preparing to go into the courtroom, but the results found by these advanced analytical laboratories can often times can make or break a case for a lawyer. Shri Thanedar Ph.D., Avomeen Analytical Services CEO and Chief Chemist has recently completed an interview with AZOM, which is part of the Azo Network. Azom’s focus is to increase the use of advanced materials by the engineering and design community worldwide and provide an outlet for those in the material science industry to share their findings. In the interview points such as what is deformulation and how can it be used, what types of industries use services such as contamination analysis, how different analytical instrumentation can be applied to solve a complex problem, and how have analytical techniques available progressed in recent years. 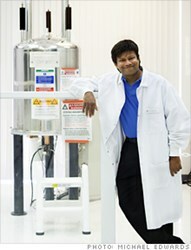 Shri Thanedar Ph.D., who can be described as a serial entrepreneur has started, grown and sold several companies within the testing laboratory and pharmaceutical services industries. Avomeen guided by Shri’s experience has grown into a leader within the chemical analysis industry providing answers to complex analytical problems for its clients. Known for their specialties including deformulation, product failure analysis, unknown material identification, formulation development, pharmaceutical analysis, and litigation support services.